The Best of Both Worlds! A great get-away beach destination located in a cozy island town, only a short drive (ten miles) from historic Charleston. Folly Beach is the closest beach to downtown Charleston. Folly is a beach town with a laid back island charm. It is known by its residents as the 'Edge of America.' It is a family beach community with undeveloped parks on either end of the island and a newly enlarged recreational boat landing on the Folly River. The Charleston Oceanfront Villas are condominiums on Folly Beach, built in 1998, with building renovations in 2008. They are centrally located, within walking distance to shops and restaurants. 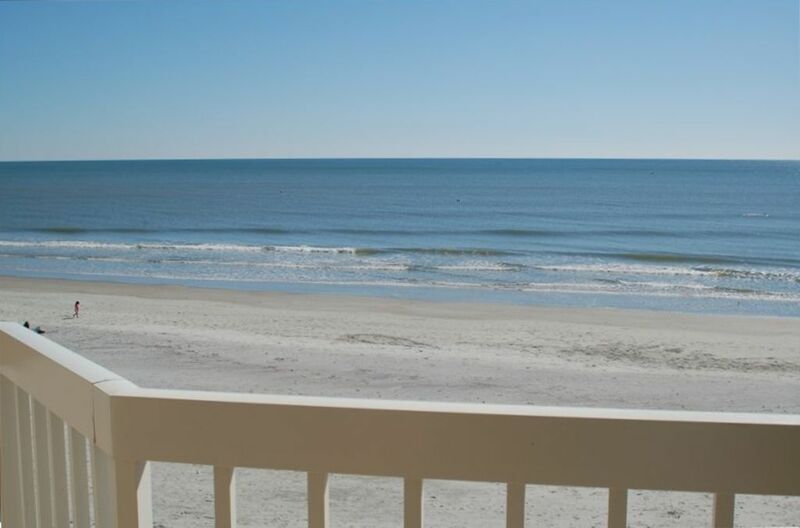 Our non-smoking, three bedroom, three bath unit has a direct oceanfront view of the Atlantic and the Folly Beach fishing pier. We have just completed a major renovation to upgrade to a luxury style accommodation. It has a beautiful beach cottage decor with antique heart pine floors, and travertine or tile in the bathrooms. The kitchen has all new cabinets with granite countertops. The bath vanities are all new with stone, marble or granite countertops. We are pleased with the outcome, and we think you will be too. We have quality furnishings throughout to include quality bedding and mattresses, in our efforts to provide attention to detail for a comfortable and clean accommodation. Pets are not allowed. No smoking. High speed wireless internet is available. Charleston/Folly Beach is a great year-round vacation destination. It is truly the best of both worlds. You can relax and enjoy the simple pleasures of the beach, such as nature walking and watching the sunset. Or, just a short drive away, you can enjoy all the history, culture, and fine dining downtown Charleston has to offer. I am a local owner and resident. I have been working in real estate since 2005. We purchased our place in 2002 and have had a wonderful experience sharing our place with guest rentals. I am honored to have made friends with many returning guests! We chose a place at Folly as it seems more like a vacation spot to us, since we live on the other side of the bridge in Mt. Pleasant. We enjoy the laid back atmosphere of Folly beach, and the ability to walk to restaurants and shops. We enjoy being right on the ocean, to sit and listen to the waves from the balcony. One guest described it best, as being on a cruise ship. The view is constant, whether you are on the beach or in the condo, you never lose sight of the ocean. Stayed at this clean, roomy condo for a quick girls weekend. We are Charleston locals and have stayed in many vacation homes, this was one of the best. The location was within easy walking distance to the main Folly restaurants, shops, and nightlife. The view of the beach was perfect, we thoroughly enjoyed our time chatting and having cocktails on the balcony. Check in and out was easy. Condo well stocked with essentials. Beds and lounging furniture comfortable. Kitchen well stocked. Was quiet while we were there as it was the off season. Host easy to work with, was flexible with check in and out times since it was the off season which was appreciated! Wish we could have stayed longer and will likely return in the future! Great place right on the beach with beautiful sunrises! A had great time just relaxing, visiting Charlesto a couple days and enjoining a wonderful Folly Beach. We will be back! Property Owner was great to work with. Met group of friends for a long weekend, helped in getting a fishing guide weeks prior to arrival. Then Hurricane Michael came through the day we were to arrive. Kim was great, allowing flexibility for all, since coming in from different areas of the country. Would stay again, location is great, close to restaurants, shops and pier. Great value for renovated and clean condo. We had a great stay at this condo. Kim was great to work with. The condo is the perfect location for the beach and all the restaurants and activities at Folly. This condo complex is definitely the best location at Folly Beach. It is within walking distance to all of the shops and restaurants. The unit was very beautiful and well stocked with most anything you would need. We had a maintenance item that needed to be done and to was taken care of the same day. It was a very enjoyable week at the beach!